Easy, Affordable Raw kickstarts your raw food lifestyle with everything that you need to know. How do I organize my kitchen? What kind of ingredients should I buy? Pie for breakfast? 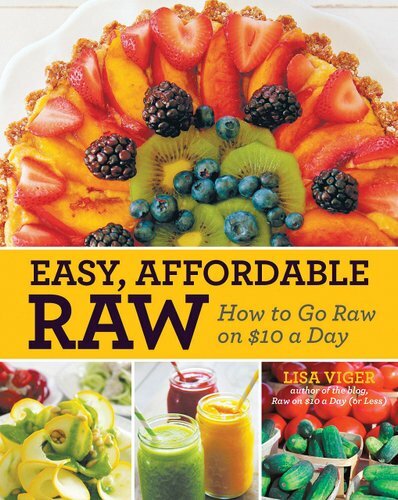 Lisa Viger, author and raw food expert, easily breaks down the raw food lifestyle including health and environmental benefits of a raw food diet. She also answers common questions about nutrition, protein, and energy. With more than 100 recipes that are affordable, simple, and quick to prepare, you'll be enjoying a better-feeling, cleaner body in no time. Inside you'll find fantastic salads, entrees, desserts, condiments, cheeses, and more! Make amazing recipes like: Grapefruit Pear and Candied Nut Salad with Blood Orange Dressing, Almond Pumpkin Seed Vanilla Dried Cherry Cereal, and Avocado and Arugula Pizza! Easy, Affordable Raw is a practical handbook and recipe book that makes the raw food lifestyle totally accessible for anyone, anywhere, even on a smaller budget.